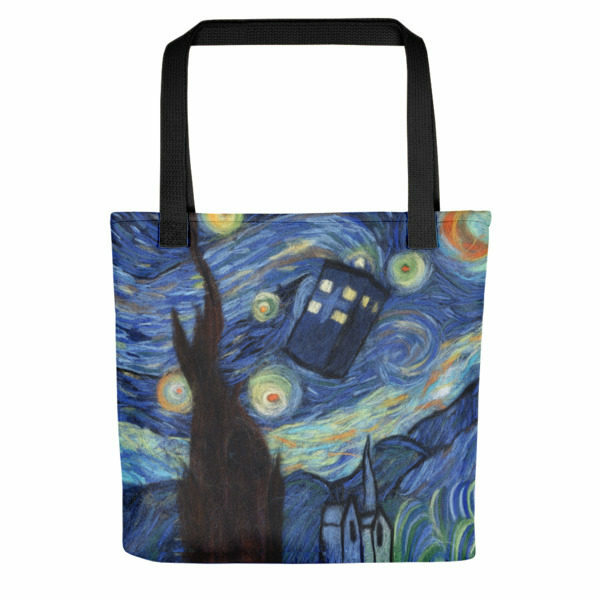 Are you a fan of “Doctor Who?” Do you admire the Vincent Van Gogh painting “Starry Night?” Well then, the combination of these two iconic themes on a tote bag will make a terrific addition to your collection. This one-of-a-kind specialty tote bag features one of my original wool paintings “Starry Night”. The printed reproduction is of such high quality that you can see the individual wool fibers making up the original artwork. The design is printed on both sides of the bag and you can customize yours by selecting black or yellow handles. This spacious and trendy carryall allows you to transport everything that matters. At a generous size of 15″x15″, it’s ideal for use as a grocery bag, gym bag, weekend getaway tote, beach day bag, or even to hold all of a baby’s numerous clothes and essentials. The tote bag is made of weather resistant fabric so all your important items will stay dry. It’s lightweight and features long handles that go over the shoulder, which makes it comfortable to carry. The bag can also be easily folded away for storage. 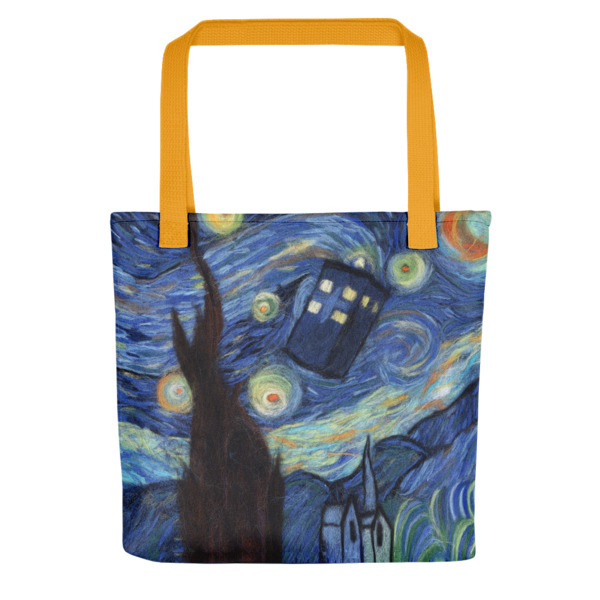 This uniquely decorated tote bag is a great gift for loved ones, friends, colleagues, and anyone that collects Doctor Who themed memorabilia or loves items featuring the artwork of Vincent Van Gogh.